The After School Courses which are scheduled between 3:30 and 6:30 p.m. are very popular with our students and parents. Parents appreciate the convenience of on-site programs, saving them from driving place to place during week nights and on weekends. Our families trust the quality of our programs and are appreciative of the fact that their children are learning from some of the best instructors from their fields in Markham and the Greater Toronto Area! 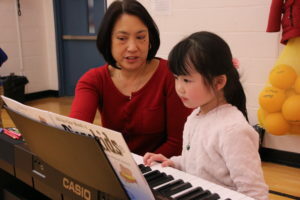 At the end of the year, parents are invited to recitals and observation classes for some of the courses. 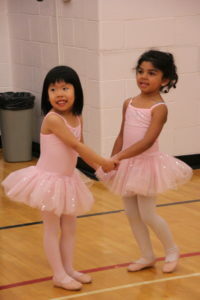 The Dance Program at TCPS is one of the longest running and most popular After School Courses. Students will begin the study of dance and ballet and will individually learn various dance skills as well as learn how to perform as a group. The first term is devoted to the study of dance and performance. The second term’s focus continues to be dance, however, students will be preparing for the end of year recital. Town Montessori Private Schools is very excited to offer ZUMBATOMIC for our Pre-School Montessori and grade 1 students. Designed exclusively for kids (ages 4-12), ZumbAtomic classes are rockin’, high energy fitness parties packed with specially choreographed, kid friendly routines and all the music kids love, like hip-hop, reggaeton, cumbia and more. Parents love ZumbAtomic because of the effects it has on kids, increasing their focus and self-confidence, boosting metabolism and enhancing coordination. Our Piano and Theory program strives to develop a well-rounded student in Music, providing group class style lessons. At TCPS students involved in the After School Music program study both piano and theory offered as distinct yet cooperative subjects. We make a commitment to producing young musicians who are taught in a classical style, with a well versed knowledge of how and why music is composed and performed. The TCPS Choir was very successful last year and the Choir program promises to provide more wonderful performance opportunities for our aspiring singers. This program will be offered to the Amarillo senior preparatory and grade 1 classes. Students who register for Choir will register for the entire year. Students will have a fun filled year learning traditional choral songs combined with contemporary repertoire as well. The After School Computer Club is a very popular program. As technology becomes more prevalent in our daily lives, the ability to use computers has become a necessity. The purpose of this program will be to introduce fun new software packages and to enhance students’ existing skills. Although students may use some of the same software as they use during class, new applications of the same software will be taught. Mad Science of Toronto is an educational organization that brings Science to schools in a fun and educational way. Lessons and experiments using light, molecules, taste buds and other scientific topics will be conducted. Mad Science is designed to introduce basic scientific concepts using a hands-on approach. Fun and interesting experiments will encourage students to expand their interest in various types of Science. Knowledge Makes Cents is a well-established financial literacy academy for children where they learn essential money skills for a successful future. Financial know-how, navigating the world of saving, smart investing and budgeting are skills that should be nurtured from a young age. Knowledge Makes Cents has a common goal: to help children become financially responsible adults. By teaching children the value of money through age-appropriate programs, Knowledge Makes Cents aims to create generations upon generations of financially literate citizens. Level 1 is for our younger pre-school age students. This course is an age appropriate introduction to a variety of sports some of which include: soccer, baseball, basketball, etc. The program also includes cooperative and interactive games all geared towards motor skill development, while building students’ confidence and team spirit. Students must be 3 years old to participate in the Level 1 program. Level 2 students will be taught through a rotational sports program of basketball, baseball (t-ball), soccer, hockey, tennis, volleyball and co-operative sports. 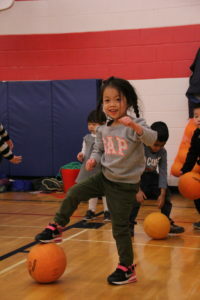 Students learn the skills, drills and rules governing these popular sports while participating in activities to improve their motor skills, co-ordination, reflexes, movement and balance. This is an excellent introduction to the Level 3 Elementary program. All levels will include warm-ups, stretches and finish with a cool down exercise. The sports programs is taught by Sports With Jay coaches. 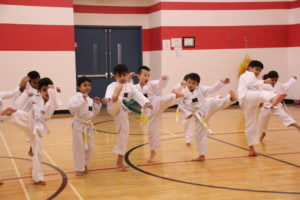 Town Centre Private Schools is pleased to continue the Tae Kwon-Do program for our Pre-School Montessori students. The program will be taught by accredited staff of the Seneca Tae Kwon-Do and Martial Arts School. Tae Kwon-Do is a traditional Korean martial art, dating back to the sixth century A.D. It is a complete, integrated, and unique system of self-defense and personal improvement. Tae Kwon-Do training addresses the whole individual and involves a great deal more than mere physical technique. Students will develop strength, stamina, speed, flexibility, co-ordination and balance. Taught by reputable masters, each student progresses at his or her own pace, according to individual effort and ability. Classes are held by age level, allowing for appropriate social interaction and individual backgrounds in Tae Kwon-Do and other martial arts. Experience is not necessary – everyone will be taught at their individual “belt” level! Students can purchase their uniform items for the class from the instructors. Effort and attendance are the main criteria to advance in Tae Kwon-Do. Students must attend a minimum number of classes per term to be considered for a test. As the students progress in their studies, each belt must be registered with the Ontario Tae Kwon-Do Association. The instructors will advise the students when they are ready to advance. Town Centre Private Schools is proud and excited to present a brand new after school program for our students. We are partnering with Pencil Studio to present an exciting arts program. Pencil studio is a popular art studio right here in Markham. For small and messy hands, Pencil Studio brings an exciting arts & crafts learning experience to children of all ages! With step-by-step demonstrations, they teach a rich variety of projects including clay modelling, paper crafting and unconventional painting techniques. Exposure to visual arts at an early age can help develop observational skills, fine motor skills and encourage creative thinking. At Pencil Studio, the goal is to nurture a long lasting interest, self confidence and independence in arts. Sewing and needlepoint are some of the skills that will be taught to the boys and girls in the Needlecrafts Course. The students will be working a number of projects that will enhance their creativity and teach an appreciation of needlecrafts. The senior preparatory and grade 1 participants in this program learn a new and valuable skill and take great pride in the work they bring home!